If ever I’m stuck for inspiration, these are the three pieces that never fail to make me feel “me” again: denim, a white tee and a leather biker jacket. It’s part of my everyday style uniform, and I’ve become quite good at changing up the look. I’ll throw in some leopard print, a checked blazer or an interesting bag, change up my shoes and add some accessories—there are tons of ways to get inventive with jeans and a tee. I’ve probably worn every style going over the years: boot-cut, straight-leg, skinny, slouchy, flared… you name it. My current favourites are cropped straight-leg jeans and cropped kick flares; it’s all about showing a little bit of ankle these days. No matter how big my denim collection (and it’s quite big) gets, I always seem to have the same three to four pairs on rotation. 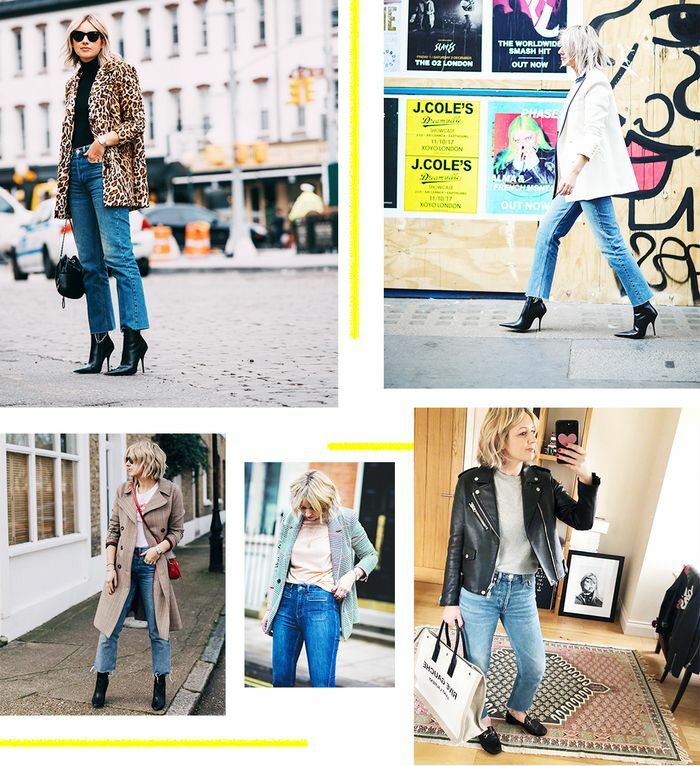 Keep reading to find out where my favourite jeans and tees are from and to see how you can restyle these two trusty pieces time and again. My current first choice? Re/Done’s Stove Pipe-High Rise (£276): With a straight leg and cropped just above the ankle with ripped-off cuffs, these are the perfect vintage-style blues, and I love how they can be dressed up or be completely casual depending on what shoes you choose. And they go with all of my shoes. Same jeans, different look. With a tucked-in tee and leather jacket, my inner 6-year-old and my current self are in heaven. There’s something so chic about wearing black denim—it instantly makes me feel smarter while still being comfortable. Right now I’m favouring cropped kick flares from Topshop called the Dree (£40)—this pair is particularly good with midi heels and bare ankles. Skinnies always work well for me with sneakers. Another favourite of mine from Re/Done is the brand’s High Rise Skinny Leg Jean (£230). These look great teamed with anything oversized on the top half. I also prefer to wear this style with my flats. Another brand I love is Iden, a sustainable British denim brand. 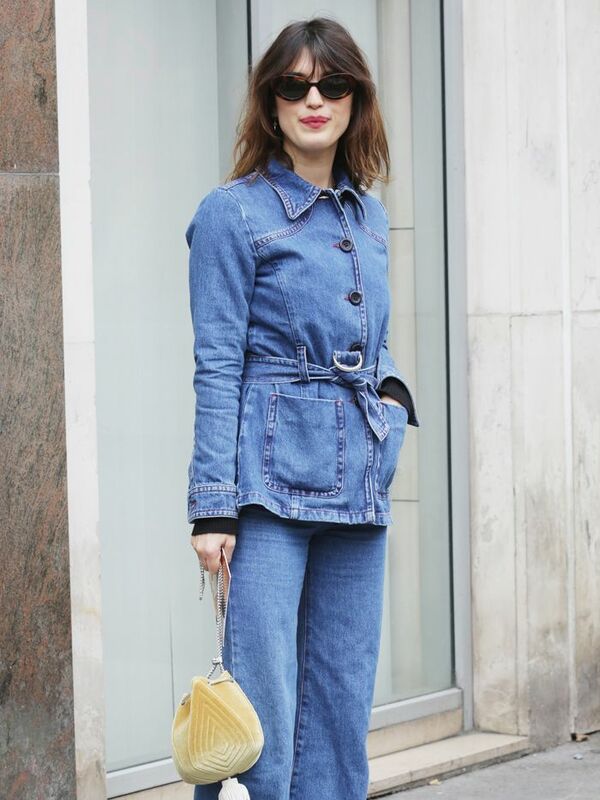 It’s a premium label but with affordable prices, which is nice to find as denim prices seem to be constantly on the rise… The Ada Kick (£145) is my top pick—I love the front-pocket details and the indigo colour; full of ’70s vibes, these work great with a smart blazer and heels. A pop of red with my most-worn Re/Done Jeans. I love the unfinished hem, and these jeans look great with an oversized coat to balance out proportions. Adding leopard print to a simple jeans and tee combination always works, no matter the season or what’s in fashion in that moment. Does that put you in the mood for Pinterest? Us too. And don’t forget to see more of Em’s fashion intel over on A Style Album.